Mount Eneas casts an early evening shadow over the Fitzpatrick Winery, which the winemakers have used to their advantage. You could say that a mountain pushed Gordon Fitzpatrick into the sparkling-wine business. 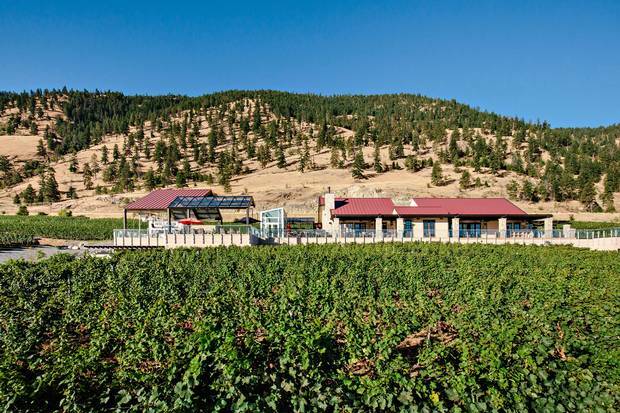 The president of Fitzpatrick Family Vineyards in British Columbia's Okanagan Valley opened an impressive facility purpose-built for Champagne-style bubbly last spring. But he had long known about the early evening shadow cast by Mount Eneas, a 655-metre peak just west of his Greata Ranch property. 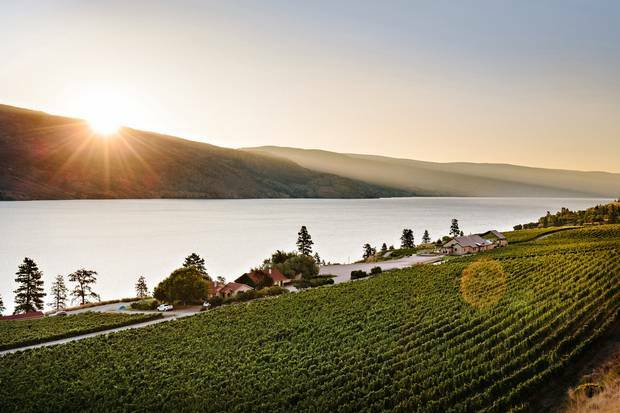 In his family's hands since 1994, the site on the shore of Lake Okanagan enjoys unusual warmth during the day, as granite on the mountain bakes and radiates heat. But it "loses the sun" about 2-1/2 hours earlier than most vineyards in the region, Fitzpatrick adds. That solar obstruction would spell trouble for producers of such late-ripening local signature varieties as merlot and syrah. But for someone intending to make sparkling wine, it's a boon. The best froth, as with that made in the often chilly Champagne region of northern France, relies on fruit that can be picked while it's still high in acidity but which also has had the time to develop substantial flavour. In other words: grapes that have kept their cool for much of the day. For Fitzpatrick, it was a case of either moving the mountain or playing to its strength. He chose the practical option. "We refer to it affectionately as shade's gift," he says of the mountain's evening effect. "We're just embracing that." The president of Fitzpatrick Family Vineyards opened an impressive facility purpose-built for Champagne-style bubbly last spring. After producing a range of superpremium still wines at CedarCreek, Fitzpatrick says his new venture's focus on top-quality, vintage-dated bubbly also gratified his urge to pursue something more "niche"-oriented on the Greata site, located halfway between Peachland and Summerland. Niche, perhaps. But British Columbia as a whole appears to be bubbling over with new sparkling wines, from high-end "traditional-method" cuvées such as Fitz, which painstakingly acquire their bubbles through a secondary fermentation in individual bottles, to tank-refermented Prosecco-style wines designed for more casual consumption. Jay Drysdale, co-owner of Bella Wines, the province's first producer devoted solely to sparkling wines, has been watching the numbers ever since he set up his boutique operation in the Okanagan's Naramata with wife Wendy Rose in 2011. Of a current total of 272 licensed grape wineries in the province, he recently counted about 90 that offer at least one bubbly as part of the product mix. "And I know probably six to eight more wineries I've seen through social media that are picking for bubbles this year that they weren't making previously," he said. Excellent examples, both recent and more established, include Haywire, Joie, Meyer Family Vineyards, Sperling, Tantalus, Township 7 and – on Vancouver Island – Blue Grouse. But three of the finest producers have been plying their trade for decades. The category essentially got its start with Steller's Jay Brut, a pet project in the late 1980s of Sumac Ridge founder and B.C.-wine pioneer Harry McWatters, who is now concocting a yet-to-be-released sparkler under his new Time label. Soon after Steller's Jay, two noteworthy bubbly specialists emerged, Blue Mountain Vineyards (which ambitiously hired a top consultant who had made Champagne at the famous French firm of Piper-Heidsieck) and Summerhill Pyramid (the latter with a flagship called Cipes Brut). A quarter-century later, both continue to craft a variety of cuvées to rival fine Champagne, with bready, toasty and honeyed characters that are the hallmark of long-term aging in bottle in contact with spent yeast cells, or lees. Now the stylistic approach is broadening, as it has been in Ontario, with several producers (including Joie and Okanagan Crush Pad's Narrative brand) following the big-batch approach used by Italy's Prosecco makers, known more technically as the charmat method. Joie and Narrative as well as Bella are also resuscitating a funky-earthy, pre-Champagne style called méthode ancestrale, which involves just one fermentation. Before the yeast can finish feeding off grape sugars, the still-sweet wine is bottled and left to complete primary fermentation under a tight bottle seal, creating carbonation along with unfiltered sediment. Tried in Canada some years ago by Hinterland Wine Company in Ontario's Prince Edward County, it is to wine geeks what cask-conditioned ales are to craft-beer snobs. Regardless of style, sparkling wine is labour-intensive, and it's unlikely British Columbia would be turning out so much froth today were it not for access to labour-saving technologies – in this case mainly a new make-your-own sparkling-wine facility in Penticton. Norman Cole, founder and proprietor of Artus Bottling, had been providing mobile bottling services to Okanagan wineries for a decade, using tractor trailers that set up temporary shop in winery driveways. Two years ago, he constructed a 13,000-square-foot warehouse primarily to serve the growing number of still-wine producers eager to add a bit of sparkle to their product portfolios. 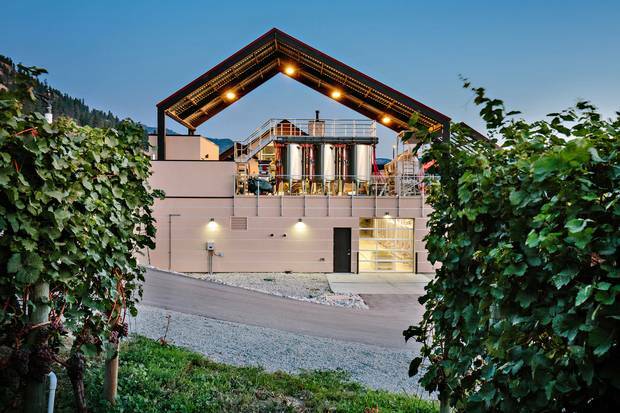 Winemakers can deliver their "base" wines to the facility by the tank-load, then work with Cole to give the wines the Champagne or Prosecco treatment – with bubble-generating refermentation taking place either in bottles or large tanks. For the Champagne method, Cole later employs a robotic "riddling" machine, or gyropalette, where, following a period of maturation, hundreds of inverted bottles at a time are twisted and jerked in a cage at intervals to force dead-yeast sediment slowly downward toward the neck for easy removal. Once the solid plug of sediment is disgorged, the bottles are topped up with reserve wine and corked. It's a process that used to take five weeks under the mostly abandoned, centuries-old hand-riddling method (which Bella, with its minimalist, natural-wine approach, still uses for its tiny, 2,000-bottle-a-year output). By robot, the time is more like five days. "In the past, if you were going to get into sparkling-wine production, you couldn't just dip your toe into it," Cole said. "You kind of had to go all in because of the equipment that you needed to buy to be able to do the process successfully. What we've done is we've removed that barrier to entry for wineries." For his part, Bella's Drysdale would like to see more producers committing more deeply to the category – the way some have done in Nova Scotia, say – not just treating sparkling wine as an afterthought for the sake of having a varied product portfolio. "If the wineries really doubled down on bubbles, then I think it could be a real signature for B.C.," he said. Fitzpatrick Winery offers visitor tours to help consumers understand how the sparkling wine is made. At Greata Ranch, Fitzpatrick, who has his own gyropalette and disgorging equipment, is committed to pushing the hospitality and educational component so that consumers come to know sparkling wine in all its complex glory, not just as a New Year's bling accessory or mindless Prosecco quaff. To that end, he's set up two visitor tours, one lasting half an hour, the other 75 minutes. Guests begin in a gathering room for a short talk, then step out into the vineyard, then onto the grape-crush deck, then down to the production facilities, including the barrel room and arched-ceiling, cave-like cellar. A video demonstrates his $12,000 gyropalette in action as well as the sediment-disgorging process. "It is neat," Fitzpatrick said. "Because they go, 'Oh, my goodness, I had no idea.'" Of course, the tour also includes a peek at Mount Eneas – and a short treatise about how Fitz is made in the shade. SCORE: 92 PRICE: $32.99 in B.C. Bone-dry, with well-controlled effervescence. Green apple immediately takes centre stage, joined by peach, pear and lemon zest in this winery flagship, which spent 24 months on lees. Brioche yeastiness starts to come through in the second act, moving the wine from its initial fresh-orchard-fruit profile into the pastry kitchen. Nicely nervy, with chalky minerality and a hint of toasted almond on the finish. A blend of 72-per-cent chardonnay and 28-per-cent pinot noir. Available in B.C. liquor stores and direct from the winery, fitzwine.com. SCORE: 94 PRICE: $39.90 in B.C. To say it tastes "as good as Champagne" is to understate the matter, because there are decent Champagnes and there are really good ones. This compares favourably with many in the latter camp. The Mavety family behind Blue Mountain take their bubbles seriously. The Brut Reserve, a blend of pinot noir and chardonnay, spent an impressive 6-1/2 years maturing in bottle in contact with lees, vastly longer than the norm for Champagne. Result: a richer, creamier texture and more pronounced autolytic flavours of honey, biscuit and toasted nuts. It's all lifted and held tight and bright by Blue Mountain's classic high-watt acidity. Available direct at bluemountainwinery.com. SCORE: 93 PRICE: $50 in B.C. A blend of pinot noir and chardonnay aged for five years on lees. Plenty of autolytic depth from that maturation period, with rich brioche, rancio-sherry and honey characters mixed with lemon curd and grilled pineapple. Great tension between fruit richness and formidable acidity. Available direct, sperlingvineyards.com.